Bite sized pizzas with zucchini slice ‘crusts’. Last year when I made my eggplant pizzas for the first time I just knew that I would have to try a zucchini version! I already knew that zucchini works amazingly well as a pizza crust since I make zucchini crust pizzas throughout zucchini season so simplifying things a bit and just using slices of zucchini for the pizza ‘crust’ sounded perfect! Most zucchini that you get in the grocery store these days are relatively small so these pizzas are bite sized but if you head out to your famers market you should be able to get some pretty large zucchini, say about 3-5 inched across, for even larger zucchini pizzas. These zucchini pizzas are super simple to make, you just need to pre-cook the zucchini a bit, top them with pizza sauce, cheese and your favourite pizza toppings and broil them until the cheese melts. 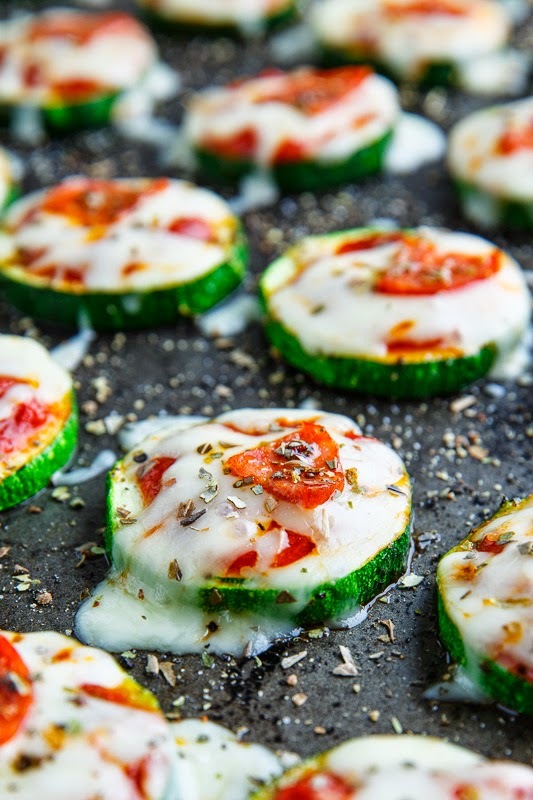 You could easily serve these zucchini pizza bites as snacks or as dinner and they are a great way to get your kids to eat more vegetables! Brush or spray the zucchini slices with oil on both sides, season with salt and pepper, grill, broil or saute until just tender, about 1-2 minutes per side, place them on a greased baking sheet, top them with sauce, cheese and pepperoni and broil until the cheese has melted, about 2 minutes, before optionally sprinkling with oregano or italian seasoning to taste. Option: Use you favourite pizza toppings! Ahhh I'm obsessed with this idea! 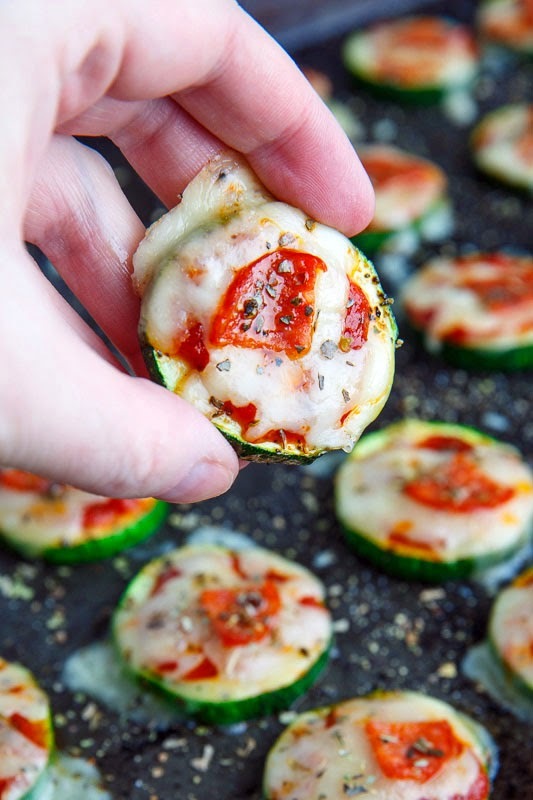 Such a great way to make zucchini more fun! What a fun idea!! Great way to get kids involved too! This is such a sweet idea! Love it and totally doing this for my boys!! Kevin, I am totally making this today!! I have one huge zucchini in my fridge and didn't know what I was going to do until now! love the animated pizza gif action! I could pop about 20 of these in my mouth! Just in time for lunch today! Love this!! What an awesome idea, Kevin, love these! This is my kind of recipe – healthy and pizza! I need to have a cocktail party ASAP! I plan to serve these at my next book club meeting! Yum! I love turning my summer veggies as pizza crust 🙂 They taste so good and it's a great way to get kids to eat their veggies. These are the perfect use for all that summer zucchini, plus my waistline will thank me for not loading up on traditional pizza crust. Awesome! So much better than bagel bites from the store! Love these! The garden is overloaded with zucchini and I've never thought of this! Great idea! This is very interesting recipe. I have to try it, looks very delicious and it's healthy too. I tried them yesterday, it was so good! but I used frankfuert slices instead of pepperoni, thank you for your ideas! Holy mackerel–I can't wait to try these! I love these!! 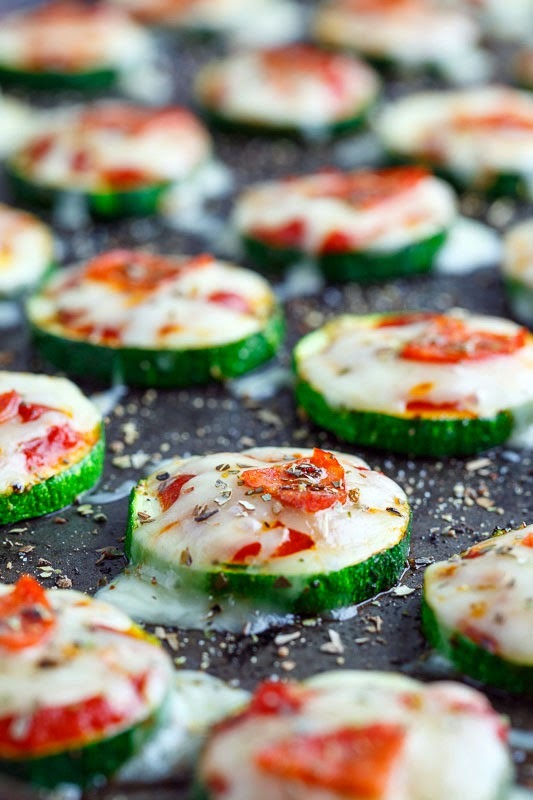 Love zucchini in all ways look delicious!!! These are absolutely perfect! I love this idea! I made this last night. I used eggplant instead of zucchini. I made half with white pizza sauce. Incredible. Love Love Love this. And is great for anyone single or for just 2 – to just use the Toaster Oven. First I sliced all the zucchini I had (5) – put the slices on the tray that fits in the toaster oven – sprayed both side with coconut oil spray – baked both sides, then added enough Pizza Sauce & i had sprinkled some Italian Seasoning on top of the sauce so the seasoning would be on the veggie & not sprinkled all over the tray. Then added small slices of cheese on top (the first time I add small slices of some summer sausage I had) I cooked this last week & this week, Can't seem to get enough. And the rest of the sliced zucchini, I put in a zipper Food Saver bag so made a quick & easy meal or snack. Thank you for this complete idea/recipe. Honestly, I didn't think I would like zucchini – Surprise……….. I do. This looks so yummy! The pizza gif makes it even yummier! It is so easy to prepare and I love the idea of zucchini as pizza crust. Delicious! I love eggplants in every form so thank You for this recipe. OMG,what a delicious recipe! Just can't wait to taste it. Brilliant performance. I will definitely try this. The pictures look amazing. Thanks for the great addition. Great recipe. I like to mix it up and use both zucchini and yellow summer squash. Adds a little variety and is basically the same to prepare. Thanks!